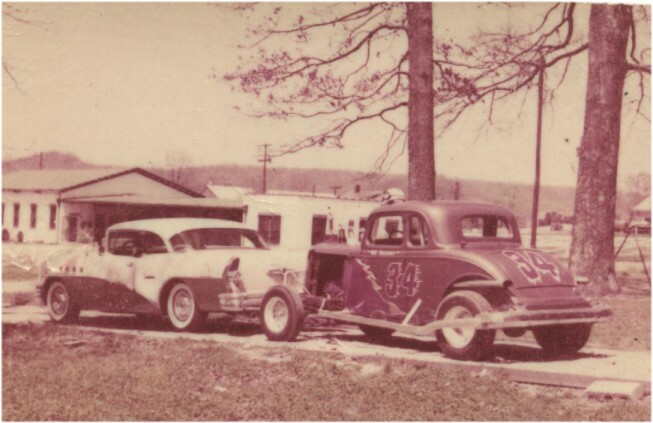 A race car belonging to Bill Reeser is shown in a photograph made in the driveway of the Reeser home on Oak Heights Drive in Livingston. A car very similar to this one entered races at the Mitchell Speedway. The old strawberry plant can be seen in the background. Everyone who has grown up during the 40's, 50's, and 60's in the Livingston/Overton County area is familiar with what has been known as the "Mitchell Curve." Lots of accidents happened in that particular curve before the highway was reworked and the number changed from Highway 42 to Highway 111. Those improvements have helped lessen the number of accidents in that stretch of roadway. A large farm that runs along the right side of that highway has been in the Mitchell family for many years. It was on that farm in the early 1950's a very large crowd would gather on Sunday afternoons to enjoy being entertained by young men who dared to be a little on the reckless side. Mitchell Speedway held a ten-lap heat race where a lot of action was involved by those who entered, and many times the audience witnessed car crashes and vehicles being flipped and turned over. The race cars were usually 1934-1939 Fords that had been rebuilt to include roll bars. George Tulloss, who worked at E.B. Gray Jewelry in Livingston, was field judge for these races. Arvis White, who lived near the track, helped keep the dust somewhat settled before the races began. Many of the drivers drove for various business owners in Livingston and Cookeville too. Gabe Sells, one of my sources of information for this story, drove for both Harold Lane of Lane's Auto Parts in Cookeville, and also for Aubrey McCormick of McCormick Motors here in Livingston. Gabe’s race car was sponsored by the Dipsy Doodle of Cookeville. Ed and Carvel Cope also drove for Aubrey McCormick. Some lively entertainment included at these races was in the form of a stuntman from Lafayette, Tn, who went by the name of "Crash" Brown. His part of the program would sometimes include being shot from a cannon, and other times, he would climb inside what was described as a casket shaped box that would be "blown up" after he got it in. Another stunt he included was using a ramp to jump over several cars that had been lined up. He would sometimes lay underneath boards on the track while several of the race cars drove over the boards. On some occasions, he brought along his own personal ambulance just in case some of the stunts he had planned didn’t work out quite as well as he hoped they would. Even though Ray Austin was not quite old enough to participate in races, he was there most Sundays, and worked while the races were going on selling hot dogs and cokes to the audience. By the way, Ray is remembered by some of his classmates as being the only eighth grader attending Livingston Grammar School who drove his own car to school, a 1930 Model A Ford. But that's another story! Dicky Mitchell recalled that a bicycle race was held one Sunday afternoon boys around his age participated in. The race consisted of one lap around the track. Although Dickie says Ray Sells was the winner of the bicycle race, Ray told me he could remember riding his bike around the track, but he didn’t remember winning the race. Ray said what he really enjoyed seeing at Mitchell Speedway was the quarter midget race cars, a specially built type of race car. Some local fellows who built and raced these cars were Randall Dulworth, Burns Averitt, and Herb Savage. Colleen Reeser had planned to drive in a Powder Puff race one Sunday afternoon, but during a practice session, those plans were changed. She buckled herself in behind the wheel of her husband, Bill Reeser’s number B-29 race car and began to make a round. The plan was that Bill would ride in the passenger side and give her instructions during this practice race. But as they approached the car Jo Ann Mitchell Simcox was driving just ahead of them, Bill told Colleen to pass her so they wouldn’t have to eat the dust from Jo Ann’s car. Colleen did what Bill told her, but floor boarded the car while passing Jo Ann. As they approached the second turn, Colleen lost control and the car began to slide, then went into a roll. Observers watching saw Bill’s body being almost thrown from the car, but somehow, he managed to pull himself back inside the car. The vehicle flipped over twice and was badly damaged in the wreck. Neither Bill or Colleen were injured, but that one short practice run was the only time Colleen tried her skills at racing. The wrecked car was later repaired and used again in other races. Bill Reeser was well known as being the winner of most races he entered in this and the surrounding area. To someone who has turned off Highway 111 onto Linder Mountain Road, there isn’t much evidence to indicate that a race track ever existed just a short distance away. But if it were possible to turn the clock back to a Sunday afternoon when a race was getting started at Mitchell Speedway, we would probably have a hard time finding a place to park. Folks who attended parked in nearby fields and just about anywhere else a space could be found. 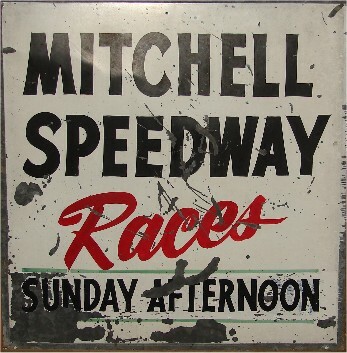 Outside of a couple of the cars that were wrecked and abandoned at track, but later removed and restored, the only thing that remains as proof the track was ever there is the sign bearing the words "Mitchell Speedway." It now makes its home in the family room of Dicky and Liz Mitchell, about a half a mile or so from the location where it was first placed. A dirt track that was once buzzing with activity has gradually over the years returned to just a pasture, a sign of how time marches on leaving only memories behind. And even though all this took place less than fifty years ago, only a few who were either drivers or sponsors of the races at Mitchell Speedway are still alive today.